Flu season is approaching, and wouldn’t you know it, all three of my little ones seem to be coming down with something. There’s nothing more pitiful or helpless than a sick baby. For me, the worst part is the not knowing: are we dealing with a baby that’s sick, an ear infection, or just allergies? Should we call the pediatrician or take the baby in? When we do call, the first thing they always seem to ask is whether or not the baby is having a fever. The problem is that those cute little baby thermometers they give you in the hospital don’t work for crap when we leave the hospital. I feel stupid telling the nurse over the phone “Well, he sure feels warm, but his temperature is 94.” It’s ridiculous. Compare that to the pediatrician’s office, where they wave a high-tech handheld thermometer somewhere in the vicinity of my baby’s forehead. It beeps almost instantly, taking a super-accurate temperature that’s right on the money. I want one of those, and I just found out, I can get it. 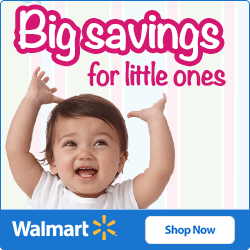 Amazon has two bestselling digital baby thermometers: the Braun Thermoscan (an ear thermometer) and the Feverwatch non-contact thermometer. Both are under $40 with free shipping. Below I compare their features in some detail, but first, let’s talk about some good reasons to invest in a good baby thermometer. Accurate temperature reading. That’s number one. I’d like to finally sound competent on the phone with the doctor’s office. Fast temperature taking. The little hospital thermometers seem to take forever when you’re trying to pin them in a squirming baby’s armpit. These measure temps in just a few seconds. Know and record baby temperatures. 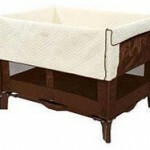 These will even save the most recent temperatures, so you can track your baby’s fever as it rises and falls. 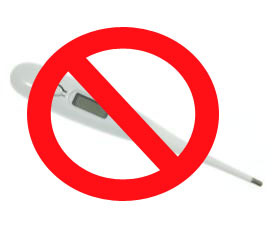 Take baby’s temperature without a fight. 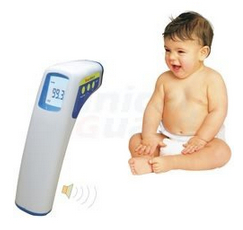 Either an ear measurement or a non-contact model will go much better than the traditional ways of temperature-taking. Now, let’s compare some of the features of these two bestsellers. Small, soft, flexible, pre-warmed tip. A huge backlit LCD screen, so you can take temperature even in dark rooms. Stores up to 32 temperature readings for future reference. No touch, so no need for disposable tips and no risk of spreading germs! Imagine being able to tiptoe into the nursery while your little one sleeps and take his or her temperature without (1) turning on a light, or (2) touching the baby at all. Just brilliant. 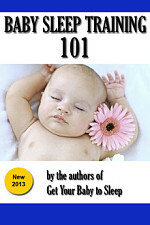 If you don’t have a good baby thermometer, get one of them now! It’s free shipping, and should arrive just in time for the sore throat / coughing / runny noses.